Azure Functions provide a simple way to deploy code in a scalable, cost-effective way. The beauty of Azure functions is that the developer does not need to worry about where they are deployed. Azure takes care of spinning up a server and other resources at the appropriate time and scaling out a Function as demand increases. The infrastructure is abstracted away from the developer allowing the developer to focus on the code and the business problem. Each Function has a "Trigger" which, as the name implies is an event that causes the function code to run. This can be an HTTP request, a message on a queue or message bus, delivery of an email, data inserted into a blob storage container or CosmosDB database, or a timed interval. Triggers are just one way that Azure functions can easily connect to other services. There are also bindings available to interact with databases, queues, and other services with a minimum of code. One nice feature of Azure Function Apps is the "Consumption Plan" pricing model. Selecting this plan means that you are only charged while your function is running, which can save plenty of money - particularly if your app is not running 24 hours a day every day. Of course, you can also choose to run your function as part of an App Service Plan, in which case you will pay for the entire time the function is available, whether or not it is running. This may be desirable if you already have an App Service Plan running and want to include your functions in that same plan. You can create functions directly in the Azure Portal. Or you can create them locally using tools like Visual Studio and Visual Code and deploy them either directly from the IDE or through your continuous integration processes. The source code for the Azure Functions run-time is even open source! Check out the code at https://github.com/Azure/azure-functions-host. You can get a free Azure account at http://azure.com. You can read more about Azure functions at https://docs.microsoft.com/en-us/azure/azure-functions. In upcoming articles, I'll show you how to create, deploy, test, and manage Azure functions. 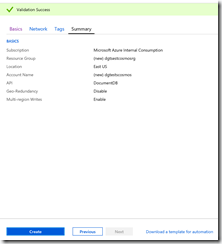 Learn how to configure continuous deployment from GitHub to Azure functions. Each time you push code changes to GitHub, that code is automatically deployed to Azure. 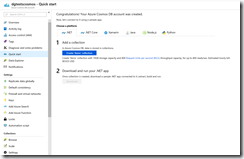 In the last article, I showed how to create a new Azure CosmosDB account. In this article, I will show how to add a database with containers to that account. Open the "Data Explorer" blade, as shown in Fig. 3. For a newly-created account, no databases are listed. To create a new database, click the [New Database] button (Fig. 4). The "New Database" blade displays, as shown in Fig. 5. At the "Database id" field, enter a unique id for your database. After a few seconds, a new database will display in the "Data Explorer" blade, as shown in Fig. 6. At the "Collection Id" field, enter a name for your collection. Collection names must be unique within a database. Select the appropriate Storage capacity. If you expect to store a small amount of data, select "Fixed"; for databases expected to grow beyond 10GB, select "Unlimited". If you select unlimited, you can specify a path within each document to find the Partition Key. A Partition Key is used to determine which data to keep together when distributing data across multiple servers. At the "Throughput" field, enter the number of 1K documents per second you need to process. You will pay more for higher throughput, so consider whether you need a higher throughput before increasing this value. Click the [OK] button to create the collection. The new collection will display beneath the database as shown in Fig. 9. You may need to expand the tree in order to see the collection. You can write to and read from this collection programmatically or you can upload document within the portal by clicking the [Upload] button, as shown in Fig. 10. Data in a CosmosDB account is stored in databases and collections. This article showed how to create these. Azure CosmosDB is a flexible, fast, reliable, scalable, geographically distributed NoSQL database. 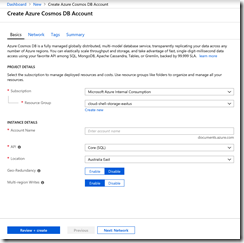 You can create a CosmosDB account and database in the Azure poral. Navigate to the Azure portal and login. Click the [Create a resource] button, as shown in Fig. 1. 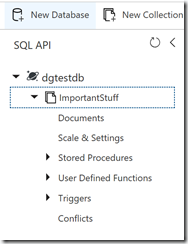 From the menu, select Database | Azure CosmosDB, as shown in Fig. 2. The "Create Azure CosmosDB Account" blade displays, as shown in Fig. 3. At the Subscription dropdown, select your Azure subscription. Most of you will have only one subscription. At the Resource Group dropdown, select an existing resource group or click "Create new" to display the New Resource Group dialog, as shown in Fig. 4. In the New Resource Group dialog, enter a unique name for your resource group and click the [OK] button. If you are migrating data from another database, you may want to choose the API that resembles your old database in order to minimize changes to the client code accessing the database. If this is a new database, you may wish to choose the API with which you and your team are most familiar. At the "Location" dropdown, select a region in which to store your data. It is a good idea to keep your data near your users and/or near any services that will interact with your data. The "Geo-Redundancy" and "Multi-region writes" options allow you to globally distribute your data. There is an extra charge for enabling these features. You can enable Geo-Redundancy by clicking the [Enable] button next to "Geo-Redundancy". This creates a copy of your data in another nearby region and keeps that data in sync. Click the [Enable] button next to "Multi-region writes" if you wish to allow data to be written in multiple regions. This will improve the performance when writing data to the database. Notice the tabs at the top of the page (Fig. 5). The "Basics" tab displays first, but the "Network", "Tags", and "Summary" tabs are also available. The "Network" tab (Fig. 7) allows you to add your CosmosDB account to a specific Virtual Network and Subnet. This is not required. The "Tags" tab (Fig. 8) allows you to assign metadata to this CosmosDB account, which may help when grouping together related accounts on a report. This is not required. The "Summary" tab (Fig. 9) displays all the options you have chosen and validates that you completed the required responses and that all responses are consistent. You can navigate to this tab by clicking the "Summary" tab link at the top or by clicking the [Review + create] button on any other tab. Click the [Create] button to begin creating your CosmosDB account. This will take a few minutes. A message displays as shown in Fig. 10 when the account is created and deployed. As you can see, there are a number of links to documentation and tutorials. Click the [Go to resource] button to open the CosmosDB account. By default, the "Quick start" blade displays, as shown in Fig. 11. 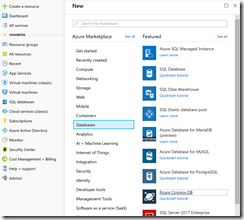 In this article, I showed how to create a new Azure CosmosDB account. In the next article, I will show how to add a database with containers to that account. Hao Luo talks about the Rust programming language, how it works, and how he is using it. Today I am grateful for my first visit to Montreal in almost 12 years. Today I am grateful to visit St. Ours, Quebec yesterday - home of some of my ancestors. Today I am grateful for Montreal smoked meats and poutine. Today I am grateful for dinner last night at a rotating Portuguese restaurant high above Montreal with Brent, LaBrina, and Sarah. Today I am grateful to attend my first home Montreal Canadiens game yesterday. Today I am grateful for dinner with Nick last night. Today I am grateful to attend an exciting Red Wings victory at Little Caesars Arena last night. Today I am grateful to be my nephew Sterling's sponsor for his confirmation last night. Today I am grateful for dinner last night with Esteban. Today I am grateful for a week in Dallas. Today I am grateful for dinner last night with Tristan, Joe, Timothy, Sergii, Danny, Denis, and Ashley. Today I am grateful to attend a Dallas Stars home game for the first time. Today I am grateful for dinner last night with Amanda, Timothy, and Sergii. Today I am grateful for Texas BBQ. Today I am grateful for all the good restaurants in Chicago. Today I am grateful to wake up to this view every morning. Today I am grateful for free pound cake and ice cream at the Grand Opening of a local bakery yesterday. Today I am grateful for the colors of autumn. Today I am grateful for dinner with Corey last night. Today I am grateful for dinner with Ryan last night, where I was able to introduce him to his first Chicago-style hot dog. Today I am grateful that, after 5 years, 3 roles, and 5 managers, I still enjoy working at Microsoft. Today I am grateful for an empty seat next to me on my flights to and from Seattle. Today I am grateful for the DJ playing so much non-American music at last night's party. Today I am grateful to Brent for bringing to Seattle homemade BBQ to share with us. Today I am grateful to learn from my teammates. Today I am grateful for dinner last night in downtown Seattle with Brent, Carl, and Michael. Today I am grateful to meet Richard for a drink last night. Today I am grateful that, for the first time in my life, I have hired someone to clean my home twice a month. These are the 3 laws of robotics. They are built into the core technology of a robot's positronic brain and no robot may violate them. All robotic technology is built on top of these laws, ensuring that robots will be safe. 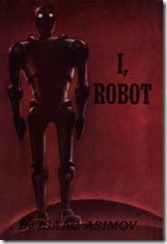 In the 1940s, Isaac Asimov wrote a series of stories speculating on the future evolution of robots and, in 1950, he compiled them into a single volume titled I, Robot. Although only loosely connected, most of the stories include Dr. Susan Calvin, a Robopsychologist at U.S. Robotics, the only company able to manufacture these machines. Many of the stories in this book revolve around the 3 laws - particularly exploring what happens when the laws come into conflict or when an ambiguous situation makes it difficult for a robot to interpret and apply the laws. The greater the conflict, the more stress placed on a positronic brain, which is why robots need a psychologist and humans need Susan Calvin to help them understand robots. These stories launched a series of very good Robot novels for Asimov, who eventually tied the universe in which his robots existed into his Empire and Foundation series. Asimov's robots and the Robotics Laws influenced many other books and movies featuring mechanical men; and even influenced the real world field of robotics, as his three laws are often brought up when discussing the ethics of the technology. In fact, the term "robotics" was invented by Asimov and first appeared in a story in this collection. I, Robot succeeds because it is based on plausible scientific principles and because it raises questions that science would be likely to encounter as it advances. There are no strong characters throughout the series (Calvin is a minor character in most of them), but the story and the ethical questions carry them along well. My favourite story is "Liar", which is about a robot that gains the ability to read minds and uses this power to do what he believes will bring no harm to humans. It is a parable of the result of good intentions wrongly applied. I, Robot is a reminder that advancing technology brings with it ethical choices and questions. Any fan of science fiction will enjoy it. You can precede any escaped character with a backslash ("\") to preserve that character. var lyrics = "\"Alive\", she cried!" If you precede the string with the "@" character, you can use a double set of quotation marks to indicate a single set of quotation marks within a string. var lyrics = @"""Alive"", she cried!" A double quote is the ASCII value 34, so you can append this to your string. You can escape Unicode characters by preceding the hexadecimal value with "\u". The hexadecimal value of a double quote is 0022, so you can include this in your string. These techniques work for many other characters that are difficult to represent within quotation marks, such as line feeds, non-English characters, and non-printing characters. There are other ways to include quotation marks within a C# string, but these should be enough to get you started.